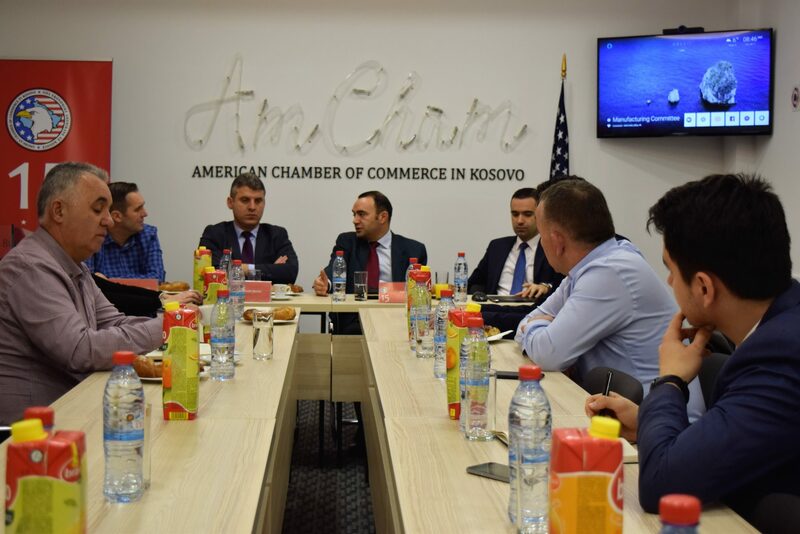 Prishtina, January 31, 2019 – Issues affecting the manufacturing sector, primarily the necessity on identifying manufacturing entities through an identification number were the main focus in the Breakfast of the Manufacturing Committee of the American Chamber of Commerce in Kosovo organized with representatives from the Ministry of Finance and Tax Administration of Kosovo. Chairperson of AmCham Manufacturing Committee, Kujtim Gjevori, while evaluating the fiscal reforms which have resulted in growth of manufacturing companies in Kosovo, he mentioned the need of adequate identification of companies in this sector in order to have a fair and equal evaluation and to precede issues of paramount importance in the further development of this sector in the future whether in enabling easier access to finance and also in fighting unfair competition. Lulzim Rafuna from the Ministry of Finance mentioned that this institution welcomes proposals and recommendations which aim on empowering the private sector in general. He said that the Ministry of Finance is focused on drafting policies that aim primarily on avoiding creating difficulties in private sector development, but rather to help and facilitate doing business. Therefore, Rafuna considered that such an identification number would make a better differentiation between manufacturing and other companies, which would also impact fair competition growth amongst others. However, he added that this should be made by clearly setting identification criteria. Nahit Sharku from Tax Administration of Kosovo also agreed on the importance of equipping manufacturing entities with the identification number since he considers that this also affects in addressing tax issues, and facilitates Tax Administration operations in general. In this direction, Sharku said that he welcomes the idea of AmCham Manufacturing Committee about the identification number and that they remain available in developing this concept. Finally, stakeholders agreed on the need in drafting an initial draft on the levels of application of this idea which would include contributions from other relevant important stakeholders in manufacturing, so that identification criteria are all-inclusive.